The leaders of France and Germany genuinely want to find a compromise that would help end the conflict in eastern Ukraine, Russian President Vladimir Putin said in his latest interview. He cited the Minsk protocol which includes the decentralization of power in Ukraine and a “reference explaining what it implies.” The authors of the reference are "our German and French partners,” he said, adding that this speaks of their sincerity in finding a compromise. “I had the impression that our partners have more trust in us than distrust, and in any case believe in our sincerity,” Putin said on Monday. Putin once again underlined the importance of implementing the Minsk agreement reached on February 12 by the Normandy Four – Ukraine, Russia, France, and Germany. “If the Minsk agreement will be implemented, I’m sure the situation will gradually normalize,” he said. Putin also dismissed as “complete nonsense” claims made by Poroshenko and the head of the Ukraine’s Security Service (SBU), Valentin Nalyvaychenko, that Russia’s presidential aide Vladislav Surkov was involved in tragic events during last year’s protests in Kiev. 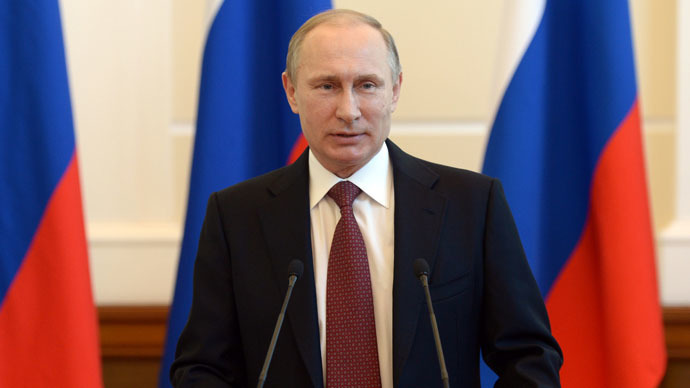 Speaking on Crimea, the president urged the international community to respect the region’s choice to rejoin Russia. “With regard to nationality, the residents of Crimea have made their choice [when they voted to join Russia] and it should be respected. Russia cannot treat it otherwise,” he said.